Broadcasting online is easy enough. But consistency is another matter. Even when you know what you’re doing, managing several pieces of equipment can get tricky fast. And especially if you have to set things up more than once, or if you happen to be a novice with tech. The Marantz Professional AVS Self Contained Audio Video Streamer is about delivering an all-in-one solution to broadcasting. It’s intended for internet streamers, gamers, podcasts, and essentially anyone else who needs a professional presentation from one device. This self-contained device has what could be called an ambitious design. 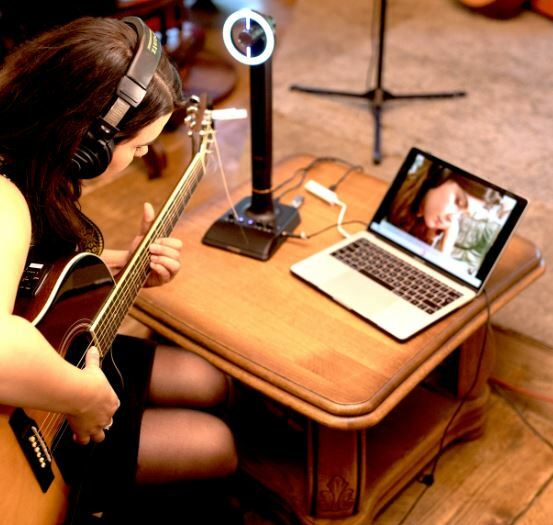 Aiming to accommodate essentially any type of recording without the need for additional equipment. And it manages to get the job done pretty elegantly because it hits every detail in just the right way. From the use of low-latency USB-C connectors, to the addition of an onboard microphone amplifier – Marantz is serious when they call this turret a self-contained system. And within a relatively simple, compact design, it’s easy to find reasons to like their Professional AVS Streamer. Many of these all-in-one type devices end up looking like a webcam. Interestingly, the Marantz Professional AVS looks more like a microphone. Standing up straight, its extendible height can range between 17.7” and 19.6”. Likewise, when fully drawn inward, its width is only 16.7”, but it can be extended towards 33.9” with minimal adjustment. That makes it portable to take on location, and nimble enough to fit on a desk with a minimal footprint. It’s hard to miss the broadcasting beacon at the top of the AVS. 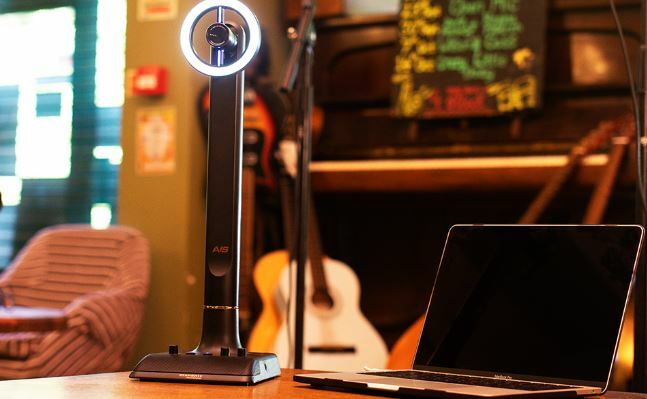 It contains the video/microphone combination, surrounded by a bright circular LED. Those LEDs helps give you a visual indication about the status of your broadcasting. Are you live? Did something happen to the stream? The lights will let you know. Using minimal desk space, the base measures 6.8 x 8-inches. And that solid base is essential the Marantz Professional AVS managing to stay flexible. Keeping it stable, and preventing it from becoming top-heavy, this streamer actually weighs about 7.7 lbs. Pretty hefty. Most of that weight is towards the base of the device, keeping its center of gravity lower to the ground. And a good portion of the weight is actually related to onboard hardware. For example, within the tower, there’s an integrated preamp to help boost the onboard microphone. A little extra force from the amp helps deliver nothing short of an impressive range of control over the microphone signal. All in real-time, and all directly from the tower, without having to deal with a bunch of confusing software. With a headphone output port on its backside, you’ll find there’s no delay in your capacity for monitoring, either. The base provides a small bundle of control buttons, including many primary controls. That includes the previously mentioned headphone jack, a headphone volume control knob, mic gain knob, mic mute button, and a camera on/off button. It’s literally every major control you need for broadcasting online, all in one place. Control is simple because its broken into three knobs and two buttons. The knobs issue control over the microphone and volume, while the buttons give control for A/V muting. It’s a user-oriented design that uses common sense. And that makes the Marantz Professional AVS both easy to use and totally intuitive. On those mute buttons, you’ll find two LEDs, giving you visual confirmation that you’ve actually pressed them. It’s on the rear-side of the base where you’ll find the aforementioned USB-C port. There’s also a pair of USB 3.0 jacks, and a 12V DC power port, though these are less remarkable additions. Perhaps the most noteworthy portion aspect of this streamer’s style is the bright LED ring at the top. The LED ring is somewhat impressive in its own right. Spread over a 100mm diameter, these lights deliver 5600K daylight brightness. These lights are capable of getting quite bright, intended to help provide lighting across your face as needed. And that can help even-out mediocre lighting conditions within a room. The lights are even adjustable because the Marantz Professional AVS Self Contained AV Streamer includes a variety of light filter accessories. They’re basically diffused daylight filter accessories, which snap on to the Professional AVS. And you can use them to make those lights on the AVS warmer or cooler, adjustable 7000K and 3000K respectively. Stylistically, having your choice of lighting provides some wiggle room. Are you shooting from a room with warmer light? Use the 3000K filter. Are you shooting with cooler light? Use the 7000K filter. If this type of thing doesn’t matter to you on aesthetic grounds, it’s worth keeping in mind the 3000K accessory also to protect your eyes from blue light. At the heart of any self-contained streaming center, there’s got to be excellent video quality. With the Professional AVS Streamer, Marantz decided to build around a 2-megapixel sensor. It’s aimed at delivering full 1080p video. Additionally, that resolution can be dropped to 720p for people who are concerned with network conditions. Either resolution makes use of 30FPS capture, which is slightly above the smoothness of broadcast television. In addition, the video stream takes advantage of h.264 video compression to keep down bandwidth consumption. That can be especially useful if you intend to record your videos in addition to streaming them, saving quite a bit of storage space in short time. Another important thing to keep in mind is the camera’s field of view. The AVS Self Contained AV Streamer makes use of a diagonal field of view 78°. It’s a fairly narrow shot of the room, intended to be used for someone who’s sitting a short distance away from their camera. In other words, it’s intended to work essentially the same way as a webcam. It’s easy to underestimate the importance of a good microphone amplifier. But the amplifier is what’s really being recorded and broadcast — it’s essential in shaping the sound that people end up hearing. 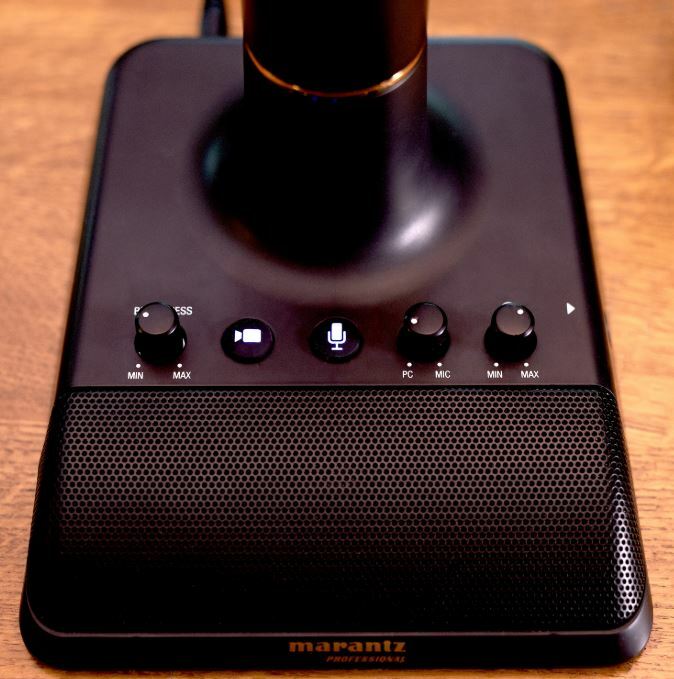 Which is why the Marantz Professional AVS is so single-mindedly focused on giving adjustable microphone control. The idea is to help you better articulate your signal precisely the way you want it to be heard. And you can check-and-adjust those settings with the use of the on-board headphone jack. The jack itself supports impedance of 30 ohms, will drive virtually any pair of headphones while maintaining the clarity and accuracy of their sound. The microphone is actually a bit bulky, it’s an electret condenser mic designed with deep levels of sensitivity, measuring about -34dB. Whether you’re whispering or shouting in excitement, these levels of sensitivity do an excellent job of picking up the detailed sound of anything going on within the room. It records it just as well, supporting 48kHz/16-bit sound. 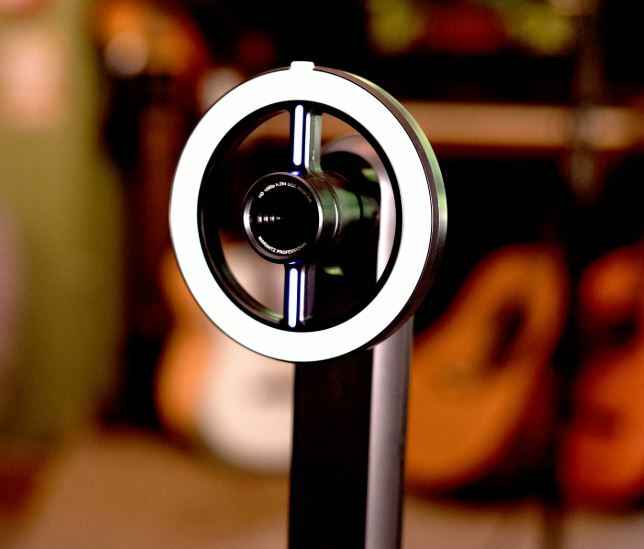 While you might not want to record your next studio album with this microphone, the distortion is exceptionally low, and helps maintain a healthy frequency response of 150-15kHz. Keep in mind, this is a microphone that’s been designed to hear things. It’s not loaded with noise isolation features, or noise cancellation features. While it is capable of being instructed to filter-out ambient noise, and does a respectable job of doing so, it’s not something you should try recording with on the street. Virtually any decent streaming software will give you almost unlimited control over your broadcast. That means, nearly any person broadcasting will already be able to do things like mute their microphone or video-feed. But having analogue controls is a bit different. An analogue button means you don’t have to mess around with software. And you’ll have visual conformation the mute is established with LEDs at the base of the Marantz Professional AVS. Compared to clicking-around in streaming software and hoping everything continues to work smoothly, there’s far less room for error. The Marantz Professional AVS Self-Contained Audio Video Streamer has a number of fairly common technical ease-of-use features. Most of these don’t bear much mention because they’re common among most modern webcams. Nevertheless, these types of features are present. For example, under low-lighting conditions, the camera will automatically trigger lighting adjustment. That helps keep things simpler as you move from one room to the next, add a new light to the room, or make an adjustment to the onboard LEDs. The Marantz AVS Streamer is widely compatible with Windows and Mac operating systems. Pretty much any version made in the past decade seems to have excellent support. 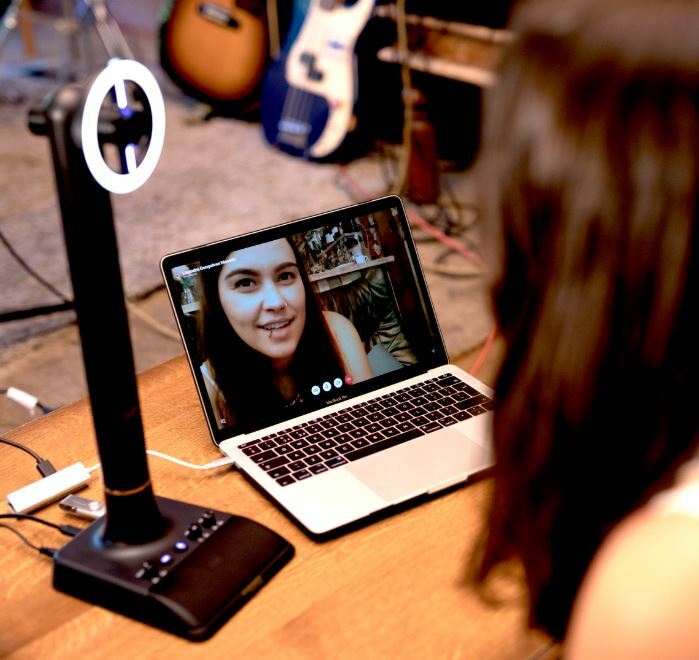 It’s compatible with Skype, and enjoys forward development, ensuring that the Professional AVS continues to remain up to date as new versions are released. One minor complaint, the USB-A ports are only capable of pushing 1A electrical current. Consequently, these ports are not ideal for charging devices. But like any powered USB port, they do get the job done eventually. Who Should Choose the Marantz Professional AVS AV Streamer? Setting up everything you need for streaming can be tough. Or it can be simple. The Marantz Professional AVS AV Streamer does its best to try and make things simple. It does that by delivering all the things you need for streaming or broadcasting in a single package. It delivers on hardware, with a microphone amplifier, providing studio quality that would meet the standards of some audiophiles. It delivers on video with fully HD standards, wrapped up in small packages for the sake of your bandwidth. And it delivers on ease of use. This streamer is likely a good choice for almost anyone who’s at least somewhat serious about their streaming. It’s footprint on your desk is negligible, but its adjustable power is not. Even if you’re a tech wizard, it’s nice to have plug-and-play solutions. And that makes it easy to recommend taking a close look at the Marantz Professional AVS AV Streamer.